Excitement is mounting in Dubai, where the stars of the air sports world have touched down for the 2015 FAI World Air Games (WAG). With 854 competitors from 55 countries competing in more than 20 different disciplines, this year’s WAG is set to be the best yet. "This is the biggest World Air Games ever," said Susanne Schödel, the secretary general of the World Air Sports Federation (FAI). "In the 110-year history of the FAI, it's the first time we have had an event like this." The action starts tomorrow, when airship pilots and hot air balloonists will be among the athletes taking to the skies. 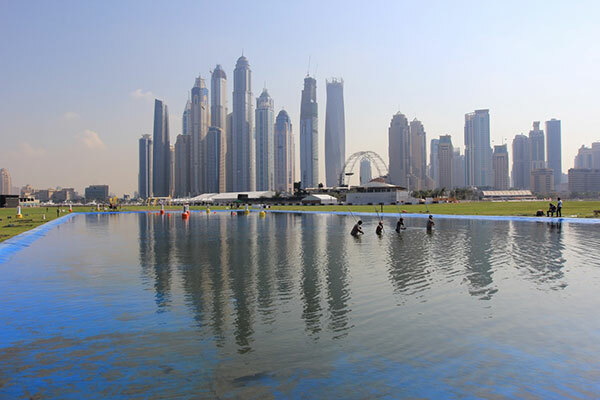 The spectacular opening ceremony will take place on December 3 at the WAG headquarters – the Skydive Dubai Palm Dropzone. Equipped with a runway, a parachute landing area and a swooping pond, the state-of-the-art site is an impressive new addition to the Dubai waterfront. The 2015 WAG will run from December 1 until December 12. Disciplines represented at the event will include model aircraft racing, paragliding aerobatics, speed skydiving, and hot air airship racing. And with many of the world’s best pilots battling for supremacy, there are bound to be plenty of thrills along the way. You can keep up with all the news from the 2015 WAG on the FAI website. Alternatively, check out the regular updates on Facebook, Twitter, Flickr and Instagram. Or if you are in Dubai, just look up!